Social Media is modern marketing, you have to be on social sites to engage customers! You know inside it's true—you should be out there marketing; selling. Years ago, you should have been handing out those business cards left and right. You probably even bought one of those little metal business card holders. It was shiny and twenty dollars. "The best investment I made all day", you thought. "If I have a really nice business card case, I'll keep it in my pocket and be ready. Surely it'll help my small business market itself; I'll be handing out my immaculately crafted business cards to every passerby! I'll have new clients in no time and that twenty dollar trinket will have made me a killing!" Now and again, you even got a lead out of a card and your local small business marketing efforts. Maybe even made a sale from one. Who cares if Jill got a little offended by you forcing those flimsy four color paper cut devils into everyone's hands at her Halloween party. You kept it up, too. For a day. It's so tiring. What's that line from Glengarry Glen Ross? Chasing cold introductions at networking events to drop some business cards and run was the embodiment of the pre-social media days of marketing. Here's the thing about social media for your small or local business: it's like having a team of A.B.C'ers working for you. All the time; day and night. Twitter, so sharp and witty with their concise bursts, spouts off the key points of what's going on with your business and brand. Pinterest has laid out the how-to visual for a homemade version of your product that'll leave your customers even more enthralled with your professional version. Your "team" of social sites are out there; networking within a qualified group of potential clients and customers gathering leads, developing your brand, and building a presence for your organization. It's just what business cards used to do. Admittedly, they still do it for some folks (am I the only one that gets randomly approached at the local Panera about a "business opportunity"?). That's just fine, it can, and does, work for some. I'm just here to tell you there's a better, more effective way to go about it. More importantly, you don't have to come home exhausted while trying to "pitch" all evening at dinner. Now, that doesn't mean it's easy. It's still a lot of effort to put together the social media sites, your marketing message, and the proposition of your local business. You'll still be pounding the virtual pavement, too. Your small business social media profiles will die an ugly, public death if left unloved. The difference is, you can do it at your own pace, measure, and track. You want to build a rhythm for your social media site posting frequency. Your audience will grow to expect you to post at a certain rate, and that's going to be based on how you start. It's best to be consistent; remember, these are your customers—or potential customers—well, they're at least folks you care about to some degree. Don't let their expectations down, that's part of building trust! You want people to trust your brand. Consider creating a Content Calendar to help schedule the process. There's a tremendous amount of data available for page/profile owners on nearly every social media site platform. There's a lot of key information in this data that'll pertain to local business. You'll want to learn about the analytics data the social media site offers. If the site offers "personal" and "business" profiles, you'll want to check how the analytics systems differ between them. For example, Facebook offers Facebook Pages Insights while personal Facebook profiles offer little to no analytics data. This could even impact which platforms you decide to use depending on your strategy. Twitter Analytics offers its users the ability to analyze its follower's locations. 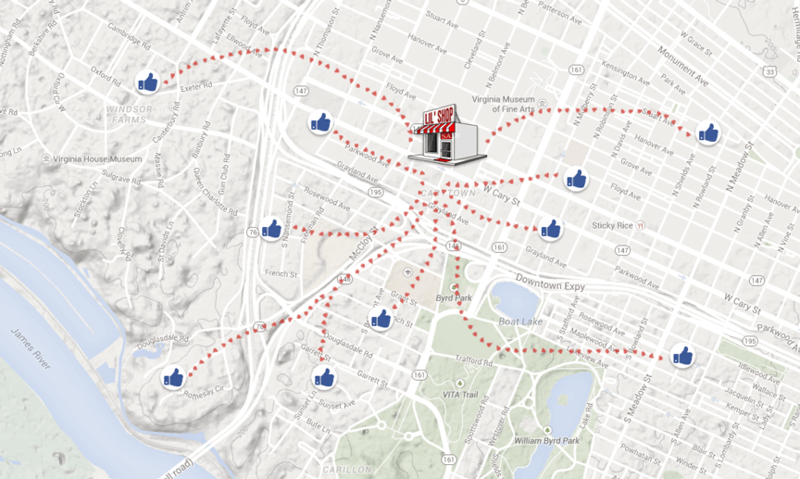 This can help you understand the location of your followers and possibly target new markets. Perhaps you didn't realize a particular service or product you offer really appeals to a neighboring metro region. This can showcase new opportunities. Location is one of many pieces of analytics data available to Twitter users. Most major social media sites offer similar datasets to profile owners that can offer valuable insight to local small business. Now's the hard part. You only have so much energy and there's countless social media platforms out there. The big ones are Facebook, Twitter, LinkedIn, and Google+. If your business does anything visual whatsoever, Pinterest should be considered a core social media tool, too. You may wish to at least consider reserving your business name by creating profiles across all these social media sites. With your limited time and energy, you probably don't want to try to stay current and engaged on every one of these platforms. After all, your business doesn't pay you to read social timelines, right? When making the decision, focus on deciphering where your audience is. Where will your target customer or client exist? If you work with other businesses, you're more likely to find their brands represented on LinkedIn or Twitter than on Google+ or Pinterest. If you sell handcrafted products, having beautiful galleries on Pinterest might just get shared well across Facebook. Try to utilize your social media content creation time, as constrained as it will likely be, effectively. Find your customers and work to build your social reputation where they are. As this article closes, you may be thinking, "wait a minute, you promised me social media workers!" "What happened to Twitter and Pinterest going around and doing my business card work for me?" I hear you. But, we had to get you started on the tools first. You may have even noticed your social media platform of choice offers more than a simple site and timeline: it offers you and your business a personal profile. A way to build your brand with a short description, logo, and even a link to your site. Just like a business card. You might even think of it as a social media business card. In the next part of this local search series, we'll walk through using this precious space to help target your customers, establish your NAP, and raise brand awareness with your new local small business marketing efforts through social media.